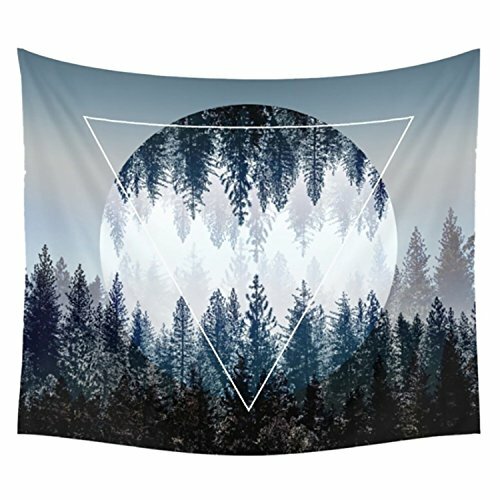 MYSTERIOUS SUNSET FOREST TAPESTRY: This tapestry makes you immersive in the beautiful forest with moon in the sky. You will enjoy the awesome feeling with it. 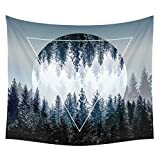 HIGH QUALITY METARIAL: Made from microfiber peach with printed top and hand-sewn finished edges, this handmade sunset forest tapestry isinfinitely superior to other materials. TWO DISTINCT SIZES: M - 59" x 51" ; L - 82" x 59". Choose the suitable size according to your actual situation. DIVERSE APPLICATIONS: It can be used as Picnic Blanket, Bed Cover, Beach Towel, Yoga Mat, Table Cloth, Curtain and of course as a Tapestry or a Wall Hanging or Decor or Throw Beach, College Dorm Bedspread. CARE INSTRUCTIONS: Hand wash or machine wash under gentle cycle. Please use mild detergent with cold water. Do not iron. Do not scrub it hard and prevent sharp things and insolation.